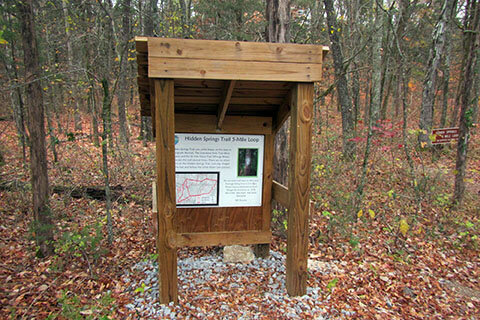 The Adventure Guide to Cedars of Lebanon State Park includes a trail description of the Hidden Springs Trail, photographs of the Hidden Springs Trail, comments from our hikes, mileage data for the Hidden Springs Trail, the custom Park topo map, and Hidden Springs Trail GPS tracklogs. 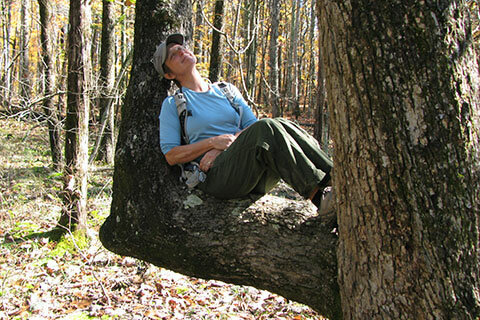 The guide will familiarize you with the Park and help you on your hike. Once in the Park, follow Cedar Forest Rd through the Park past the Park Office, campgrounds, and the group lodge, to the intersection with a road that comes from the cabins and pool (2 miles from Hwy 231). The Limestone Sinks Trailhead is almost straight ahead at the tee in the road. 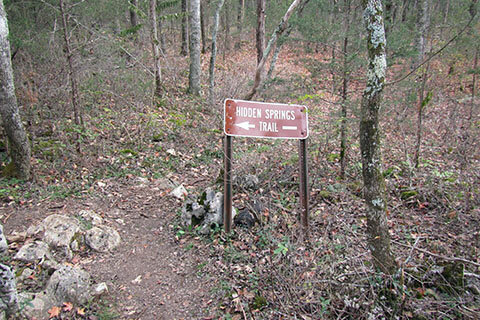 For the Hidden Springs Trailhead, veer right and turn right again after a few hundred feet. A picnic ground and trailhead parking is a short distance on the right. Note: the directions to the trailhead are well signed in the Park. Water and restrooms are available at the picnic area. Leave the parking area and cross the road. Pass the kiosk and continue a short distance to a fork in the trail. Go left at the fork. (The path makes a loop, so it really doesn't matter which path is taken, but going left - or clockwise is easier to follow.) In a tenth of a mile the trail crosses the paved Cedar Forest Road. Cross the road following the white blazes and signs. There are many animal and people paths as well as old roads that crisscross the trail. As a rule the trail is well signed and blazed. 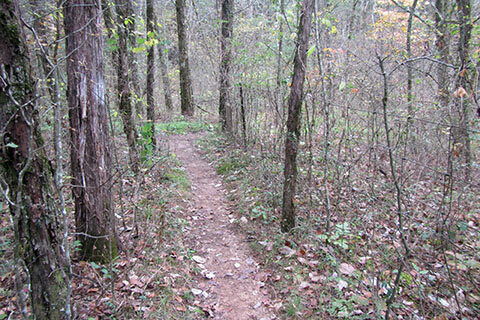 After a tenth of a mile the trail intersects on the left with a spur trail of the Limestone Sinks Trail. 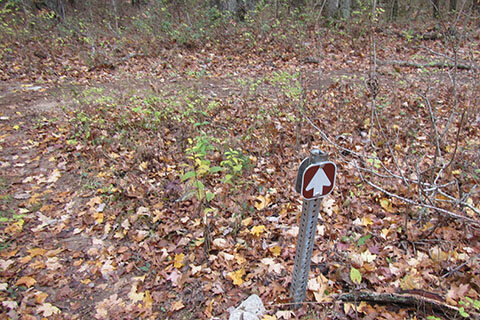 Another spur from the Limestone Sinks Trail intersects the trail in another tenth of a mile. Continue straight and, after still another tenth of a mile, the trail comes to a sign with an arrow pointing to the left. Follow the sign! The trail goes north a few hundred feet then turns right. At .30 miles (from the sign) there is an interesting tree/seat/saddle next to the trail on the right. After another .45 miles the trail crosses a creek (a drainage that flows into a sink) on a bridge. 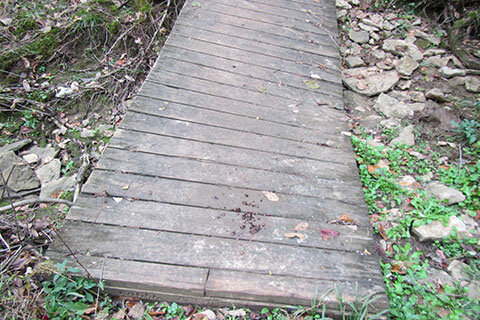 The bridge was built by Scouts. Shortly after crossing the creek the trail crosses the unimproved Burnt House Road. Heading almost due north for .35 miles the trail then turns to the right and continues along the park boundary. 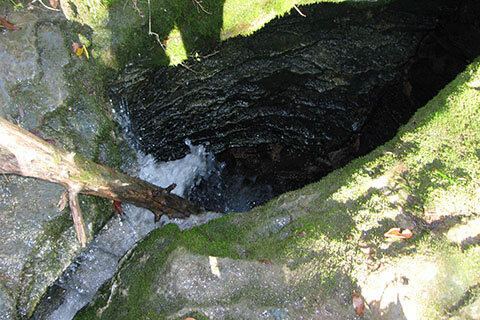 In .35 miles the trail comes to the Hidden Springs. It is a remarkable sight watching the water disappear (as long as the creek is running). 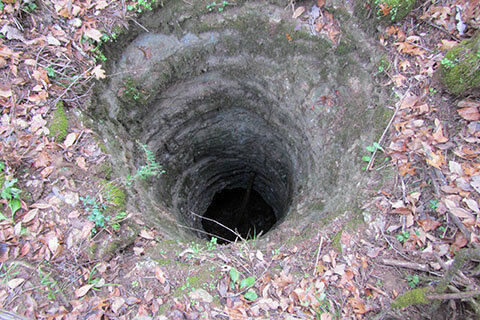 There is also a well in the area guarded by a simple rail fence. 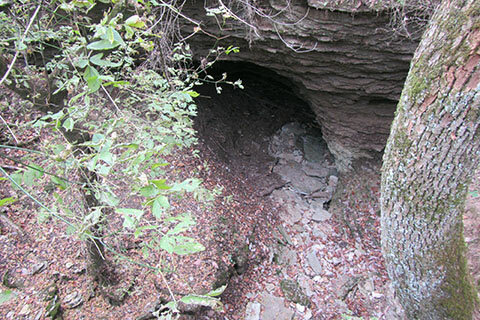 After leaving the spring it is a tenth of a mile to a large sinkhole on the left. Another tenth of a mile from the sink hole the trail, again, crosses Burnt House Rd. Still heading south, the trail crosses a seasonal spring a few times and after .50 miles from Burnt House Rd the trail crosses another unimproved road. The trail continues across a creek and then another road in .50 miles. Along this stretch there are a few sink holes on the right. In .50 miles the trail returns to the paved Cedar Forest Road. Cross the road to find the trail on the other side. From here, it is .75 miles back to the original fork in the trail. There are still more sink holes off to the right along this final section. At the fork, stay left and cross the road to return to the Parking Area. Note: the Park's info says that the trail is five miles long. I used a GPS for the distances listed in this report. The GPS maintained a strong signal throughout the hike.